This chapter gives an overview of the tool and what it supports, regarding OpenGL, GLU and GLUT. This tool is to play with OpenGL, without having to compile every single bit. It is certainly not optimized to maximum speed, nor does it implement the latest and greatest standard. For beginners and their first steps it may be helpful. Supported are many of the functions of OpenGL 1.1, GLU (GL utility), and GLUT (GL utility toolkit). Please Note: this is not an introduction into OpenGL, and is directed to people already knowing how to use a compiler, build tools, etc. Constructive comments are always welcome. All of the following GLUT function are supported. This list contains the original names given by OpenGL. The namespace within the script is gl and the functions themselfs have no prefix glut. Example: using the function glBegin within the script is changed to gl.Begin. All of the following GLUT function are supported. This list contains the original names given by GLU. The namespace within the script is glu and the functions themselfs have no prefix glut. Example: using the function gluLookAt within the script is changed to glu.LookAt. All of the following GLUT function are supported. This list contains the original names given by GLUT. The namespace within the script is glut and the functions themselfs have no prefix glut. Example: using the function glutInitWindowSize within the script is changed to glut.InitWindowSize. This chapter shows two examples how to use glua. There is not an example for every supported GL/GLU/GLUT function, but you'll get the idea. This is a very simple example that shows the bare minimum. A nice helix on black ground is drawn. The display function is very straight forward. Clear buffers, position observer (line 5), then draw a helix with growing radius. The following function handles the resize of the window. GLUT also uses this function to initialize the GL part and is therefore mandatory. In this case we use an orthogonal projection. The keyboard function listens for q,Q,ESCAPE buttons and quits the demo if occurring. The initialization is nothing special. We tell GLUT to create a window with a certain size and position. Be aware of the non-GLUT function on line 40 (marked bold). This class is necessary to let glua register the callback functions within GLUT. Everything else is just plain GL, GLU and GLUT. 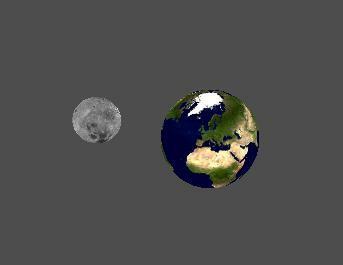 This example shows two spheres (earth and moon) in rotation. The usage of texture mapping and quadrics (GLU) are shown as well as time-based animation. The function display is used to draw the scene. In this case it is two spheres, each with a texture. One sphere shows the earth, the other the moon. The distance between them and the rotations are not accurate. First set the observer position and view direction (lines 20-24), then draw the first sphere (lines 27-34), draw the second sphere (lines 37-46) and finally let the buffers swap. This function sets the viewport and projection options. Function to increment/decrement angles and keeping them between 0 and 360 degrees. Whenever GLUT has some time to spare, this function will be called. It calculates the time since the last time the angles were altered and increases the angles for earth, the moon and the moon around the earth accordingly. At last it asks GLUT to redraw the scene. The final part does not reside within a function. It handles the entire GL/GLUT initialization, loads textures and creates the GLU quadrics. The only lines special to glua are 94, 111 and 119. Those are used to register the GLUT callback functions and get the texutre handle out of the array tex. Once you get the IDs, they can be used as normal. The following lines will not be executed, but they are here to show how to destroy the quadrics and textures. All source code provided by this page is distributed unter the terms of the GPL2. There is absolutely no warranty, download and running the program at your own risk. This source distribution does not include any OpenGL, GLU or GLUT components. It does contain the complete LUA stuff. Unfortunately, the build does not utilize the GNU autotools. However, the build was tested under Cygwin and Linux (Kubuntu 8.04). The Makefile tries to determine the platform (one of the supported) and sets all variables accordingly. All developer packages for OpenGL, GLU and GLUT have to be installed.